Andy Ogles took office as Maury County’s new mayor Friday. 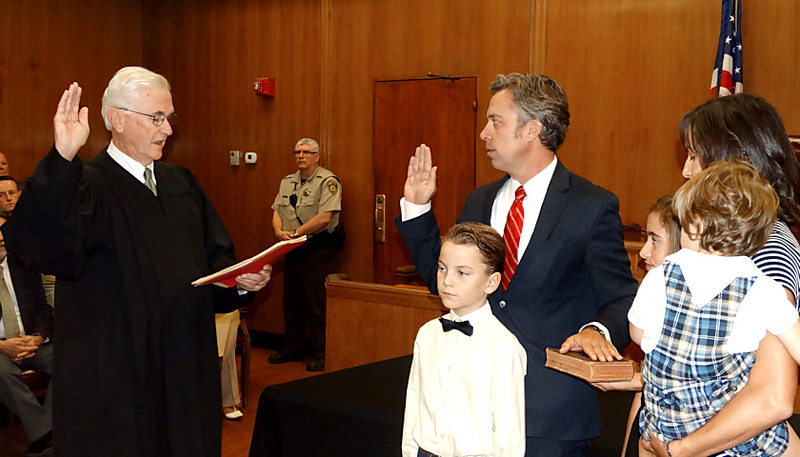 He took the oath in front of a packed courtroom on the second floor of the county courthouse. Ogles takes over as the county grows dramatically. New growth brings new businesses. That brings new jobs. That brings more new residents. As the population surges the county will need new schools. Ogles told The Tennessee Star Friday he plans to attend to those priorities early on. “We’ve got a lot of growth coming our way, no doubt about it. Currently we have $181 million in debt,” Ogles said. All the growth is an extension of what’s happening in Nashville, 46 miles to the north, putting Maury County in a great strategic position. The county also has a lower cost of living than Nashville, and that doesn’t hurt, Ogles said. Ogles said he will work with the county school superintendent and school board members to make Murray County one of the best school systems in the state. “I look forward to working closely with the school superintendent and the school board to make sure we achieve that goal,” Ogles said. Going by U.S. News & World Report rankings, most of the county’s public schools have an 80 to 100 percent graduation rate. Until last year Ogles was state director for Americans for Prosperity. A year ago, he resigned and challenged incumbent U.S. Sen. Bob Corker. Corker, however, decided against re-election. Rep. Marsha Blackburn (R-TN-07) launched her campaign for the now open seat. Ogles withdrew from the race shortly after and threw his support to Blackburn. Ogles’ election was the first time Maury County Republicans selected their candidate in a nominating convention instead of a primary. Registered voters with a record of casting ballots in three of the last four elections were eligible to participate.